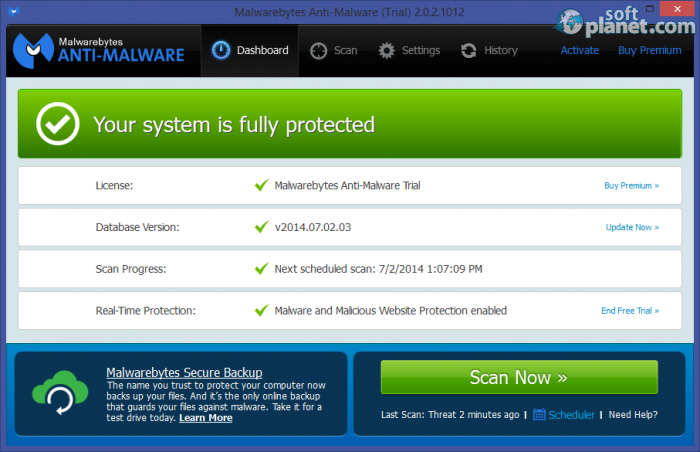 SoftPlanet makes it possible for everyone to get free Malwarebytes Anti-Malware download directly from our servers. There is no registration needed for downloading. Malwarebytes Anti-Malware Premium 2.1.4.1018 falls into the security and anti-spyware software category. It is a resident program and it can perform strong protection of your system in real time. You can feel safe with this app because it will keep you away from all kinds of threats like malware, trojans, rootkits, spyware, worms, etc. All this is possible because the program monitors every process and prevents the “bad guys” from entering into your PC. Malwarebytes Anti-Malware has low to moderate system requirements. Users with Windows XP, Vista, 7 and 8 can install it for sure. It requires only 20 MB of free disk space and supports a huge number of interface languages. 32-bit and 64-bit versions can be chosen when needed. The advanced heuristic scanning technology which is the main key to the program's success is the program's best feature. Malwarebytes Anti-Malware cannot win the contest for the best antivirus program interface. Still, it does its job with ease, as expected, and you can see it in action for free for 14 days. Anyway, its main screen has nine tabs on top which provides all the functionality of the application. The Scanner tab has three options: Quick, Full and Flash scan. The Protection tab has several check-boxes the first two of which can disable the file and the website protection. 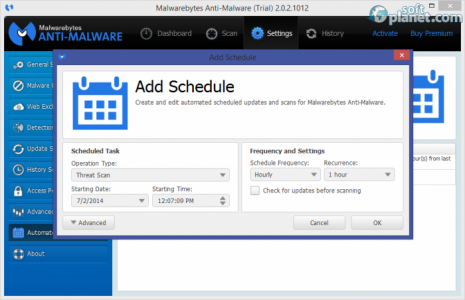 Malwarebytes Anti-Malware updates its own definitions on an hourly basis by default. But you can change that if you want by adding a new schedule, whose frequency can be real time, daily, weekly, on reboot, etc. The situation is the same with the scan settings but there you have some more options to choose from. You can reach that window from the Settings tab and then click on the Scheduler settings tab. All in all, Malwarebytes Anti-Malware Premium 2.1.4.1018 is a very efficient, lightweight and smart antivirus tool. We tested it for a while on our virtual PC and we can assure you that it is worth every penny spent on it. If you are still convinced about the program's capabilities – you have a 14-day trial period to try it for free. 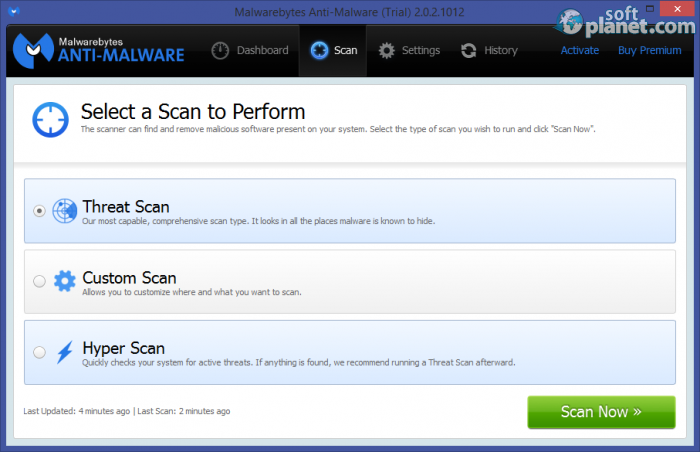 Our security scan shows that Malwarebytes Anti-Malware is clean from viruses. The current version of Malwarebytes Anti-Malware has been scanned by our system, which contains 46 different anti-virus algorithms. That ensures that Malwarebytes Anti-Malware 2.1.4.1018 is 100% safe for your computer.